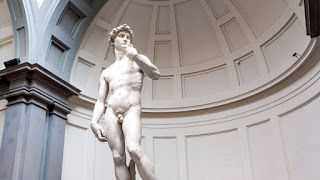 Last weekend I reported on this blog the news of an interesting decision of the Florence Court of First Instance (Tribunale di Firenze) that prohibited a travel agency, Visit Today, from using the image of Michelangelo's David for commercial purposes, including to sell unofficial tickets for guided tours inside the Galleria dell'Accademia. At the time when the blog post was published the text of the interim decision was not yet available. Now readers can access and download it here, thanks to Katfriends Fabio Ghiretti (Mondini Rusconi) and Francesco Rossi (SIB Legal). The decision (ordinanza) was rendered in the context of interim (emergency) proceedings that the Avvocatura dello Stato had brought against Visit Today pursuant to Article 669-octies of the Italian Civil Procedure Code. As anticipated, the reasoning underlying the granting of the injunction against Visit Today is rooted within the provisions of the Italian Cultural Heritage Code, also known as Codice Urbani, notably Article 108 therein. "Article 108 of the Cultural Heritage Code provides that the authority which administers a cultural good has the right to allow its reproduction, subject to an application and the payment of a royalty set by the authority itself, with the sole exception of reproductions of work for non-profit purposes. There is no doubt that the sculpture at issue [David] is a cultural good, nor is there any doubt that the authority that administers it is the Galleria dell'Accademia, which is subject to the Ministry [of Culture]; it follows that its use for for-profit purposes done through the reproduction of its image falls within the cases for which the authorization of the administrative authority is needed." While ordinary proceedings should follow the issuing of the injunction, for the time being the court ordered that Visit Today's advertising materials be destroyed, and prohibited it from using the David's image in Italy and all over Europe, whether by analogue or online means (including the undertaking's website). The court however rejected Avvocatura dello Stato's request to block completely access to Visit Today's website in that such measure would be disproportionate to the nature and scope of the infringement.